In a July protest in Moscow, more than 2000 people rallied against proposed reforms to the acedemy. VLADIVOSTOK — Hundreds of scientists and academics rallied in Russia's Far East Wednesday to protest planned reforms to the Russian Academy of Sciences. About 200 scientists were among the 800 protesters at a sanctioned rally in the Far East port city of Vladivostok, local police said. Speakers at the protest expressed concern that the planned changes will have a negative impact on research, impair links with scientific institutions abroad, and encourage young scientists to look for work outside Russia. "As a result of these reforms, we'll get a monster that's hard to manage," Viktor Bogatov, a high-ranking scientist from the academy, told RIA Novosti. "It's no coincidence that a significant proportion of young scientists are already thinking about changing their workplaces, and some want to go abroad." At the end of the rally, the participants put together a resolution to submit to the federal government urging the authorities against making hasty reforms. Citing inefficiency, the Education and Science Ministry announced a major proposal in late June for restructuring Russia's science institutions. The reforms would combine three of Russia's major science academies and remove the academy's right to manage its extensive property portfolio, including lucrative sites in the capital Moscow. The projected changes are unpopular among Russia's scientific community. 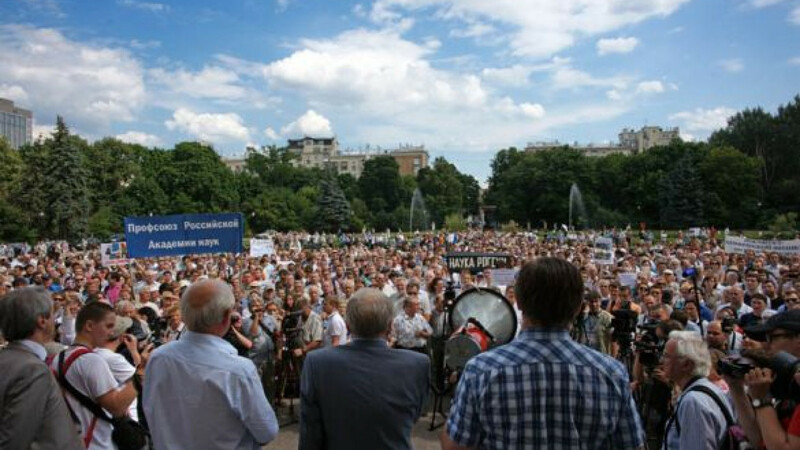 Several rallies protesting the reforms took place in July and August in Moscow. The bill has already passed two readings in the State Duma. The third and final reading is scheduled for September.